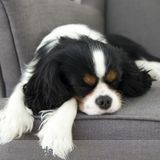 In need of a loving pet sitter to walk our 12lb King Charles Cavalier twice a day. Want to be hired by Ariane? We need a dogwalker to come to our home to walk our dog twice a day. She is a 12lb King Charles Cavalier that loves to play catch, roll in grass and snuggle with humans. The first walk would be around 11am, second walk around 3pm. Please contact us if you think this is a good fit!